If you’re a bride you know that planning a wedding can be very stressful. Your busy searching multiple places for churches, reception sites, rental equipment, caterers, florists, DJs, Photographers, Videographers, and of course the perfect wedding dress. When can you catch a break? Other than the bride, the wedding cake is the second most viewed attraction of the day. The cake is what brings everything together. So, when you are busy planning the day you should keep that in mind. In choosing the perfect wedding cake topper or accessories for your cake you should consider the following: “Theme and Budget” ! THEME : The theme of the wedding will reflect the bride and groom’s personality, style, and taste. Would you like your wedding to be more modern, fun, or traditional? As for adding accessories to or around your wedding cake, you should consider everything that helped you pick out your perfect cake topper with the addition of location and wedding colors. BUDGET : If you have a budget, like most of us do, then you will want to keep it in mind when thinking about purchasing your wedding cake topper. 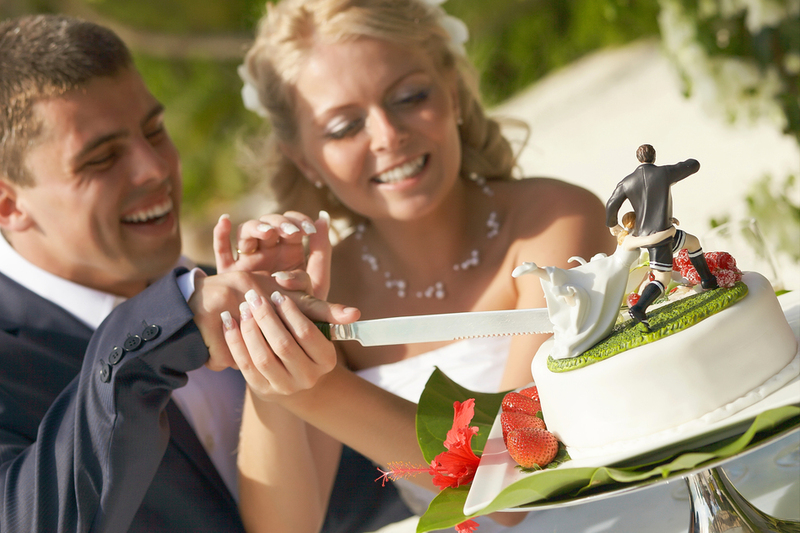 It is estimated that nearly 75% of women end up keeping their wedding cake topper. They use them for future anniversaries, or display them on a shelf at home. So you might want to invest a little more on your keepsake cake topper. For those of you lucky enough to not have a wedding day budget, then maybe you would be interested in custom wedding cake toppers. These cake toppers are designed to resemble the bride and groom reflecting both personalities. Custom cake toppers range from $500-$2500! Note: Make sure you allow at least 2-6 weeks for completion. Finally, once you have decided on what kind of cake topper you are looking for, you then need to locate it. It’s hard to find a website out there that’s “just” dedicated to cake toppers. After searching for lets say a l-o-n-g period of time, most on-line shoppers stop at one particular website dedicated to become your #1 source for the Largest, Hottest, Most Unique Selection of Just Cake Toppers Online ! (From Wedding Cake Toppers – Birthday Cake Toppers) This website is called JustCakeToppers.com.